We serve the entire Burbank area including Glendale, Pacadena, South Pacadena, Hollywood, West Hollywood, and Universal City. Burbank is a fantastic place to live and work. While you are here, take time to enjoy everything from the food to the museums. If you are going to be in the area for two months or longer, Burbank corporate housing is likely your best option, as opposed to hotels. Hollywood is regarded as the center of entertainment, but Burbank carries its own large share of California’s entertainment industry. It is home to many major production houses such as Cookie Jar Entertainment, Warner Brothers Entertainment, Insomniac Games, New Wave Entertainment, Walt Disney, Warner Music Group, ABC, Nickelodeon, and the Cartoon Network. With much of the entertainment industry's center of gravity located in Burbank, secondary services follow suit and set up their offices here as well, which is why companies like Cinelease are also located in Burbank. With all the stars coming in and out of this town, don't be surprised to find out who may have been a guest at your Burbank furnished apartment. Venturing out of your Burbank temporary housing is generally going to be very pleasant experience. As far as the climate goes, it shares similar Mediterranean weather patterns with Los Angeles. June through August it is 80° temperatures while November through March sees lows in the 40s. Record temperatures for June, stood at 111°F while record lows fell to 22°F. There isn't too much precipitation or humidity, and the cool Pacific breeze keeps things stable. The easterly winds blowing in the evening from the mountains in the east help to keep evenings dry. Be sure to take an evening stroll out from your Burbank corporate apartment. While Almost Home Burbank corporate housing comes with fully equipped kitchens, you might wish from time to time to enjoy the wonderful tastes of Burbank’s many unique restaurants. The one thing you will soon begin to appreciate is the quality and standards of food. Both, in terms of preparation and taste, food in Burbank is one of the best things this town has to offer. Castaway Restaurant on Harvard Rd. : Up in the hills of Burbank you will find the Castaway overlooking a splendid golf course. This place is a somewhat of a landmark in this town and with good reason. It has been here for some time and in that time it has won awards for its delicious cuisine and stunning style. Some of the best things you can find on a menu that boasts so many winners, are the Castaway Crab Cake and Tempura Rock Shrimp. One of the main menu favorites for lunch is also the Fresh Salmon, sauteed orzo, spinach and champagne shallot relish accompany this awesome catch. Gordon Biersch on San Bernardino Blvd. : If you're going to be in town, you would do well to pay a visit to Gordon Biersch. Any visit to Burbank is not complete if you do not make it here. Along with their great food, they are known for their the hand crafted beers. Just watching the bartender hold a glass under a spigot while it fills is enough to set the good times rolling. Give the Hefeweizen or the Marzen a try. BJ's on S 1st St.: The array of BJ's Snacks and Small Bites goes well with their excellent beer choices. The Chicken Wontons here are excellent, as are the Spinach stuffed Mushrooms. Also, you might like to try the Mini-Bruschetta and the Crispy Fried Artichokes. Bob's Big Boy on W Riverside Dr.: This place is a throwback to the 50s. It is reminiscent of the diner heydays. Here, breakfast is a meal they serve any time of the day. The burgers are delicious, but the highlight here is the breakfast menu, by far. Along with the typical pancakes, French Toast and the Belgian Waffles, you can have almost any side you want. The omelets are also a hit since you can build your own. Smokehouse on W Lakeside Dr.: This place is a legend in the LA area. It has been around since the early days of Hollywood. The food is old school and delicious. The decor is seasoned and iconic. Everything from the Fresh Fried Calamari to the King Cut Steaks and the Chateaubriand bring about an air of slow cooked precision. You should try this place at least once and allow yourself to fall in love with food once again. Make sure you visit as many studios as you can, and if possible try to get tickets for viewing a live taping of some of your favorite shows. One in particular that is an all time favorite is The Tonight Show with Jay Leno. There are other tapings as well from other studios that will be worth the time. There is more than enough things for you here that will keep you out of your Burbank furnished apartment. Museums: There are a number of museums in Burbank that you should take the effort to visit while you are here. The first on the list is the Gordon R Howard Museum on N Lomita St. Lots of things to explore and learn while you're here. There is also the Martial Arts History Museum on W Magnolia Blvd. There are some amazing collections here in addition to the resident displays. Then there is the Warner Bros VIP STUDIO TOUR on Riverside Dr and Stough Canyon Nature Center on E Walnut Ave. Performing Arts: There is a lot of contemporary culture to absorb in Burbank, especially amidst the various performing arts studios in town. To get to know this place and benefit from the west coast culture, experience performances at The Colony Theatre Company on N 3rd St. Then there is The Victory Theater on W Victory Blvd. Try to check out some of the other ones too, like Flappers Comedy Club on E Magnolia Blvd and Grover Theater City on W Olive Ave. Malls: The one thing you will quickly learn during your time here is that there is no shortage of places to shop in Burbank. There's even an IKEA on N San Fernando Blvd, if you like to put your furniture together. If you need all your shops conveniently co-located in one place, then head over to Burbank Town Center on E Magnolia Blvd. Shopping here is such a pleasant difference compared to the many of the other mall-type designs. The other place you can stroll through streets and avenue on a hunt for a good deal is through the streets of downtown Burbank where there are numerous shops and stores. Golf: There are a number of golf courses across California. Some of them are right here in Burbank, like DeBell Golf Club, located on E Walnut Ave. This is a well maintained course and provides sufficient challenge for someone looking to work up their game and relax the nerves. Lakeside Golf Club on Lakeside Dr is also a well maintained course that caters to the average player. And finally, there is the De Bell Par Golf Course on E Harvard Rd. Parks and Recreation: California offers some of the best parks and recreation facilities in the nation. City Hall manages these nature trails and aquatic centers for the community. There are even scenic picnic sites around Burbank that you could spend the evening walking your dog or just running to work up a sweat before hitting one of the really good restaurants downtown. Rancho District: Rancho is a unique and close-knit community that has been zoned to allow owners to keep horses on their property. If you live in Rancho corporate housing, you will enjoy the feel of a rural small town. Media District: The Media District is located in and around Olive Avenue, and includes the offices of many major studios such as the Disney Channel and NBC. For those that are working in show business, there are Media District furnished apartments. Hillside District: Nestled at the foot of the Verdugo Mountains lies the Hillside District. Here there are many hiking trails, as well as the DeBell public golf course and the Starlight Bowl. Hillside District corporate housing is for nature lovers. Burbank/Toluca Lake: The Burbank side of Toluca Lake likes to borrow some of the shine of its wealthy neighbor. However, living in Burbank/Toluca Lake corporate housing will give you all of the glamour of the neighborhood, but will still allow you access to the city municipal services such as excellent schools. Magnolia Park: If you despise big-box stores and chain restaurants, you will love Magnolia Park's independently owned shops and cafes. Here you will find antiques, furniture, and vintage clothing on tree-lined boulevards. 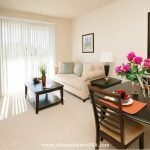 If you like the funkier side of Southern California, you'll love Magnolia Park furnished apartments. Northwest District: The Northwest District is a friendly area with parks and plenty of shops. Originally the site of the aerospace industry in Burbank, today the area is family-friendly and not as expensive as other parts of Burbank. If you're looking for a safe, middle class neighborhood, look no further than Northwest District corporate housing. Chandler Bikeway: Here the houses are located on some of the smallest lots in the city. Because the bikeway was only recently converted from an abandoned railroad tracks, the property values in this part of Burbank have only begun to skyrocket. The Chandler Bikeway has flowerbeds and two bronze sculpture gardens. 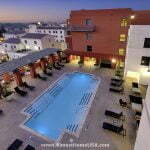 Chandler Bikeway furnished apartments are a beautiful way to begin your life in Burbank.